Little Adventures: In The Beginning . . . . 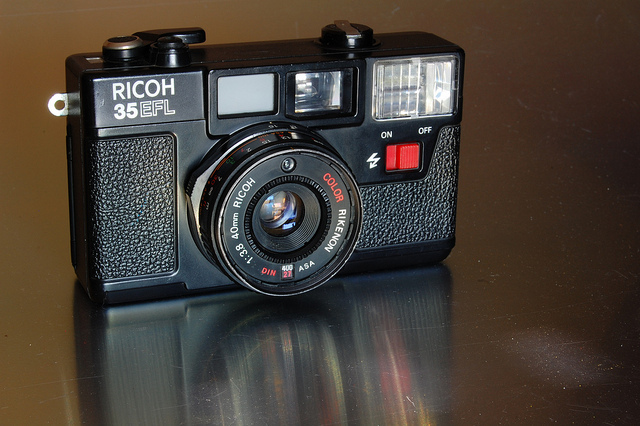 It was a Ricoh 35 EFL film camera. 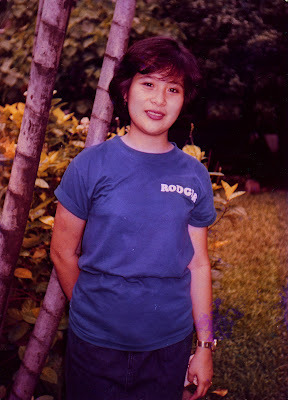 It's all plastic and cheap (not more than PHP 1,000 . . . and remember, this was in 1983!!!) and it was probably made in Taiwan. I briefly mentioned this camera in a much earlier blog post here. I'm doing a little bit of nostalgia here and I just thought of sharing this with all of you. You might find it interesting. I am so loving my X10 - the way it performs and the way it looks - and how cameras-were-used-to-be-made-this-way thing, so I thought of doing a search in Google for images of old cameras and I stumbled into this (Credits to the photographer, I did not get your name or link, and congratulations if this camera is your. Looks like it's still in good shape.) Suddenly, memories of how it felt like when I started in photography started to rush in. Anyway, like I said, it's cheap so everything is made of plastic, even the lens. It's all mechanical so you could totally use it even without batteries. Its only features that require the use of batteries is the built-in flash and built-in light meter. Can you imagine that? You can do photography with this camera without batteries!! Now let me clarify on that "built-in light meter". It's not a light meter per se where it could tell you whether your settings is underexposed or over by 1 or 2 stops - no nothing like that. Its electric eye (that tiny thing in front of the lens barrel that looks like an LED lamp) is attached to a small lamp in the window viewfinder. If you see a green light, then you get a correct exposure with your settings. If not, then your settings are wrong and you're left on your own to figure out how to make it right. Basically, your only control on exposure is the aperture because the shutter is fixed at 1/125 second. Film speed setting depends on what film you load it with. You can say it's in "fixed shutter priority mode". For all you digital age babies who have not experienced film photography, ASA/DIN film speed ratings is the ancestor of your digital camera's ISO settings. Unlike digital where you can set your ISO from shot to shot, with film, you're basically stuck with one speed per roll. The cameras film speed setting is just a switch to tell your camera whether it is loaded with ASA 100 or 400 film roll for the "light meter" to adjust its sensitivity. Of course you can use other film speeds (ASA 200 were available then for consumer use) but you can no longer rely on the camera's one and only electronic aid. The camera is not a rangefinder so the viewfinder, while bright, does not give you any aid in focusing. It's just a window with frame lines to assist you in composing your picture. The fixed Rikenon 40mm f/3.8 lens is manual focus only and the viewfinder does not give you any help . . . so how do you focus this thing? Well to simply put it . . . you need to have a good sense of distance because you'll just have to approximate the distance between your camera and subject and then dial that distance into the lens' focusing ring. If your judgement of distance is wrong, say hello to out-of-focus pictures. One of the photos taken by my 35 EFL. As you can see, I've been "shooting models" since high school :) Colors have changed over the years, but bck then, I can assure you that those greens and blues and skin tones were life-like - a testament to the quality of the plastic lens. Shot taken with available light. Well you can just take a look at the sample photos shown under this section. 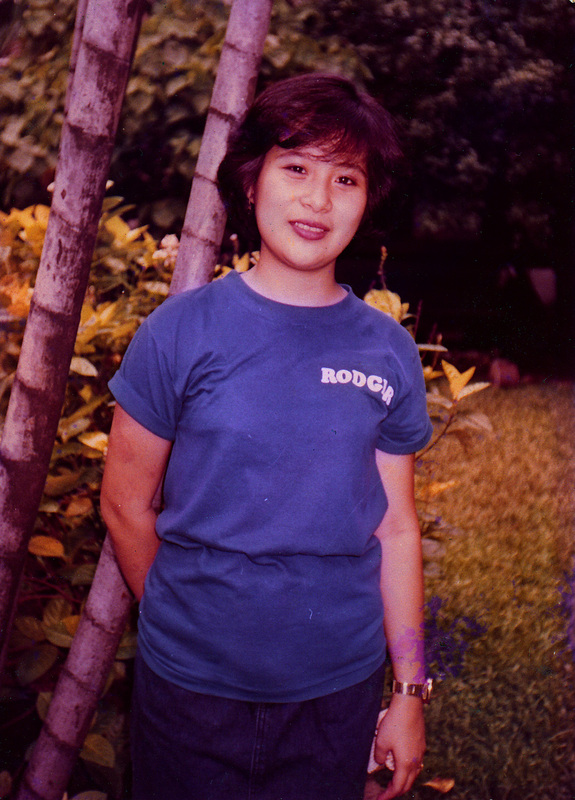 Over the years some discoloration has occured, they are scanned from commercial prints on commercial photo paper. That lens is sharp for what it is. That's all I can say. It is also possible to do bokeh shots but with the fixed shutter speed, the lighting condition really has to be right to get that f/3.8 aperture. As tedious as it is to operate for what should be a cheap and simple camera, I did produced some really very well exposed and composed pictures. It was not a tool for artistic expressions though - no hot shoe, no slow shutter, no interchangeable lens (or zoom lens), etc. But this camera introduced me to "real" photography and helped me break free from snapshooting. 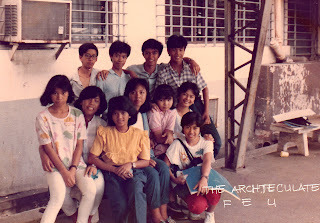 This ws taken during first year college. My college buddies, most of them I am still in contact with. I had the camera until I graduated from college - that's around 6 years. All those years of approximating distance and aperture (and keep in mind that I only get a maximum of 36 shots per roll of film) gave me the foundation of how I work out my pictures today. Without the benefit of auto-everything, I've become more analytic of the lighting situation and learned (and understood fully well) the importance of getting your settings right before clicking the shutter. Today, with a highly specified DSLR, I get the benefit of trial-and-error, like other digital photographers. When the exposure is wrong, most who have not experienced film would not know how to adjust to the situation and would resort to special effects in Photoshop. In contrast, those with film experience appreciate the importance of getting the exposure right on capture. Photoshop effects then becomes "additional flavor" to what is already a great shot, instead of a means to fix errors. I've had a long journey in photography, but the love and passion for it all began with this.